Hi, I’m a multi award-winning public speaker and speaker trainer. I’m also an international performer. I’ve been teaching, training and coaching at corporates, universities and schools for more than a decade. I once worked for blue-chip corporates in the high pressure industries of investment banking and management consulting in New York and London. Sometimes I experienced the frustration of not making an impact, mainly because I lacked confidence and didn’t know how to frame and deliver my message. Because of my then inability to communicate effectively at work, I’ve experienced what it’s like to be put on probation. I even felt the sting of being fired from a position because I didn’t speak up during meetings. 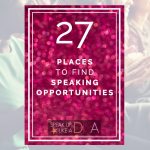 As someone who was never a naturally gifted speaker and communicator, I think this makes it easier for me to plan helpful learning activities and make a connection with my clients. I understand how they feel, having been there myself! Now, I’ve performed or spoken in front of tens of thousands of people internationally. I’ve performed for clients like Oracle, Belkin and Leica and been featured in or written for Marie Claire, Harper’s Bazaar and the BBC. I bring my training in cabaret, stand-up comedy and TV-presenting to the table helping people conquer fears, be their most engaging selves and stand proud in front of an audience, whether during a business presentation or during a job interview. If formal qualifications are your thing and you’d like to see my CV, then please scroll to the bottom of this page. I’m passionate about helping people share who they are and become their best selves. Whether I do that by keynote speaking at an event, delivering a workshop or even working with individuals, it’s what makes me tick. I have a light touch and a humorous style, making sure I always entertain as well as educate. My audience may include those that already have the gift of the gab, have total confidence ‘on stage’ and just need some structure and fine-tuning. Or perhaps there are introverts, who don’t enjoy the spotlight but have a burning desire to share their stories, ideas and creativity. When individuals have the confidence and tools to share their brilliance, amazing things happen. People are transformed into leaders. Teams and groups perform better. Everyone gains. I, like many others, have been in the situation where I was afraid to speak up at work. Afraid to share my message in case it came out wrong or was rejected by my colleagues, clients and bosses. And that’s why I’m so committed to helping people speak up and shine NOW. No more delaying opportunities to speak in meetings or putting life and business on hold by withholding ideas, creations and opinions. When people stifle themselves and fail to share their magnificence it can have so many negative results including stress, resentment and poor performance. Want to work with me 121 or have me work with your group? Attend an upcoming live training session or public talk. My strengths lie in assisting my clients with the creation of a highly structured, easy to follow presentation that is also entertaining and interactive. I help clients break down complicated or dense information and communicate it in a way that’s interesting, understandable and actionable.